The Petaluma Fire Department responded to a small plane on fire Petaluma Municipal Airport on Sunday evening. At about 6:50 p.m., fire crews arrived to find heavy smoke coming out of an airport hangar. 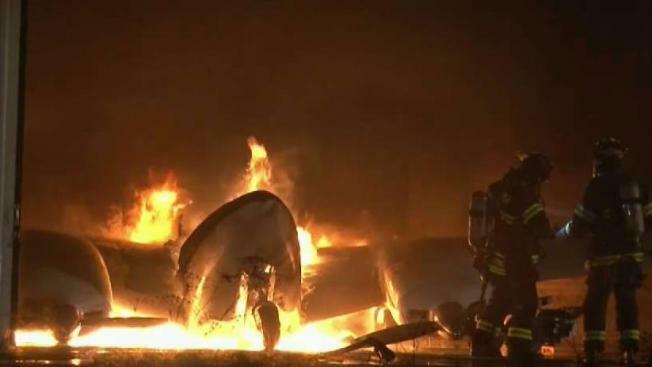 They pried open the hangar and found a twin-engine airplane fully engulfed in flames, fire officials said. About 70 gallons of aviation fuel on the plane fed the fire and spilled out onto the floor of the hanger, but the hanger was not burned, fire officials said. Firefieighters quickly worked to plug up storm drains to prevent the fuel from polluting nearby waterways, they said. The plane was a total loss.